I have a unique relationship with Pam, my neighbor and the hair stylist who has cut my hair for the past 21 years. She knows that I will call her every 6 mos. or so for a trim and sometimes that stretches into 12 or more months if things are just too hectic in my life. I began growing my hair out last year (again) and finally got it to a length that was long enough for me not to be totally shorn, but would be 10" (the length needed for Locks of Love)minimum for a donation. They won't make my hair into a wig because it is really grey and these wigs go to children, but they will sell it and the money will help the program. So, I'll be looking a little different if you see me at the studio! All the trees in place. Lost one of the trees and had to repair. Drying slowly and hoping my hands will be very steady when I set this in the kiln and again when I get to the glazing parts. But, as Scarlet O'Hara would say, "I'll think about that tomorrow"
Putting the ideas on paper. Eating and drinking and being surrounded by pottery helps! Covered jar in background is a Ron Philbeck pot I use for my sugar bowl. I had already slabbed out the sides of the piece the night before and had the general idea of the shape. Although, to be honest, I flipped the sides over a period of about an hour, mulling over which direction to make this piece. Ideas for the base, decoration and different little containers for candles, etc. Carving on one side started. Little drop-in pieces that will go in top holes. Prototype of candle holder built. Needs lots of refinement! Trees formed and setting up, waiting for carving and placement. View of top of piece with 4 of 8 trees in place. The little holes are for clay stubs that I bore into the trunks to help stabilize them on the top. Learned this the hard way when previous tree piece fell off due to inbalance and only being attached at base. The large holes will be used as is for flower arrangements or with a drop in piece to convert it to a candlabra. View of carved front with tree springs place. Awaiting dark clay spring for bases of trees. Come out and see the work in progress this weekend! Just a quick view of some of the smaller gift items I have in the studio. Come out and browse on Sat. Dec.10 and Sun, Dec. 11th. 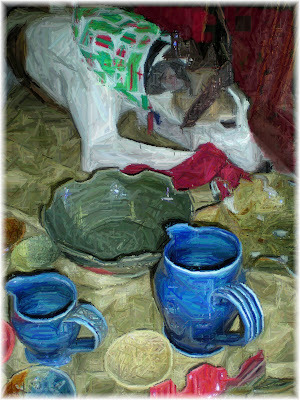 and will be providing free gift wrap for your pottery purchases those days. Hope to see you and your friends! 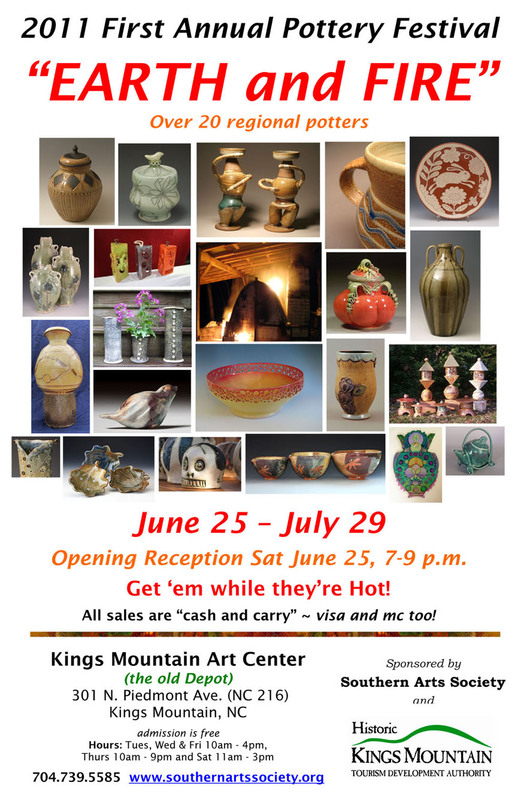 Bluegill Pottery Studio open 2-6pm today! 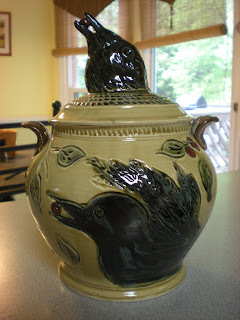 Story in Shelby Star about local potters and the Carolina Pottery Festival, which happens tomorrow. Tried to do a link for you, but you'll just have to look it up yourself. Search for Connected by clay, Shelby Star and you'll see a slideshow and a little blurb about a few of us in the area. 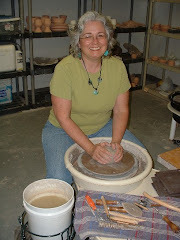 Recently my friend, Bobbie, asked me to help her fill her gas kiln with some work. She usually asks about once or twice a year in order to get a firing done more quickly, since her kiln is pretty large and takes quite a few pieces. I'm always happy to round out her load because I miss reduction firing sometimes and it makes me think differently about the pieces I make. I tend to do a little less decorating and let the kiln work it's magic more. She opened the kiln on Halloween Day and I got to ask "Was it Halloween or Christmas? ", a saying from Ben Owens, III that we first when we took a class from him at Penland. These pots will be available at the Carolina Pottery Festival on Nov. 12, in Shelby. 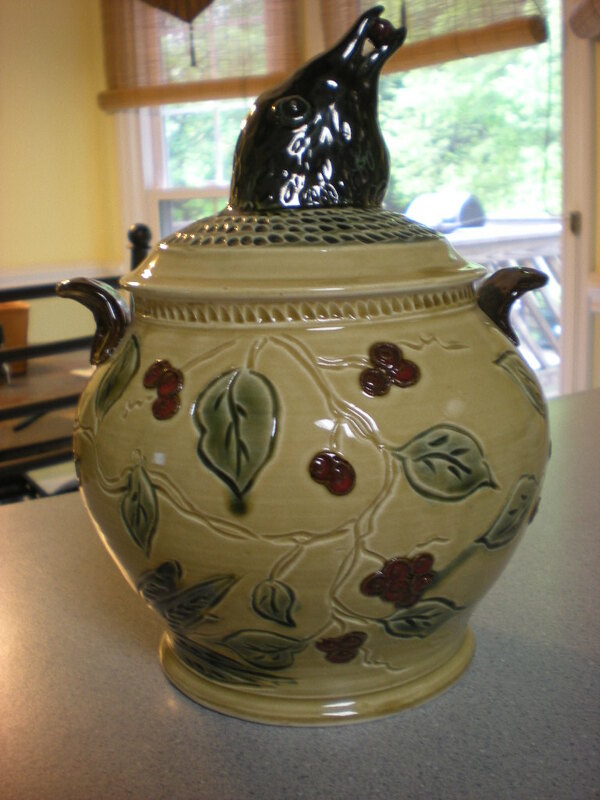 Ok, I have tried to link to the Facebook page about 6 times now and am not getting it correct, so you'll just have to look for Carolina Pottery Festival on Facebook. It's NOT the Carolina Claymatters Pottery Festival. They're the other guys that were formerly known as the McAlpine Barn Sale. A great bunch and you can like them too, but make sure you find the real page for us! Love these little squash/gourds. They are so bright and cheerful. They came home with me from the Claymatters sale and are brightening up the front hall. If I'm lucky, I can probably reuse them for the upcoming Carolina Pottery Festival in Shelby in November. Great props! 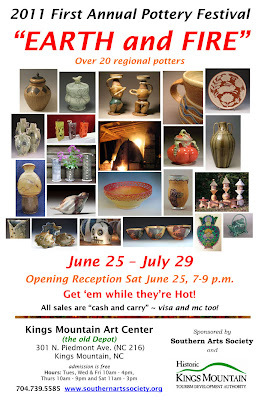 Got an invitation to send an artwork on canvas to this show, which is a fund raiser for the NC Pottery Center. This is the finished 12"x12" mixed media painting I sent in. After much staring at the blank canvas and one false start, I decided to try and capture an image I use in my pottery, which is leaves on a water surface. The ginkgo leaves are ones I gathered last fall to use on pottery (I freeze them to preserve them. ) They were at the height of color then. Sorry about the light reflections off the surface of the canvas. I used a high gloss finish over the whole painting. These were the scenes in my studio the last few weeks as I finished the wholesale orders and shipped out to the galleries in North Carolina, Connecticut, Oklahoma, and Missouri that had placed them. I breathed a deep sign of relief on Monday as the last of that batch went out. Over the past few years I have opted to do less retail shows and more wholesale business and I've found it changes the way I make work and especially the way I feel before I open a kiln. When doing specific pieces--1 maple tray in blue in small--you can't make one piece. I always double the amount and usually triple or quadruple it now. Murphy's Law certainly applies when doing specific orders. And the kiln opening is sometimes fraught with anxiety--did all the mugs come out right or will I have to go back and remake them and I may be watching the deadline to ship them out go right past me? When making work for retail shows, the pressure was different. I always wanted to come up with new work and always seemed to be opening the kiln on the morning I was leaving for a show, hoping for magic. When it was magical, it was great, but sometimes those pieces sold and I only had a few moments to savour the piece. And if the piece or the firing wasn't great, I had enough work for the show and I could experience the remorse later. So the pieces seem a lot dearer now because of the work and hope invested in them and because they are already sold/placed. Today I start some new pieces for the upcoming Claymatters show in October and that's really exciting. And I'm trying to make pieces each week for wholesale that I can "have in inventory" and I plan on basking in the glow of the good wholesale orders that I completed for at least a day or so! Then I'm going to "Get up and do it again, caught between the longing for pottery and the struggle for the legal tender" as an alteration of the Jackson Browne song goes. A long while back I had an arrangement with a lady who wanted to use studio space and she exchanged cleaning the studio for it. It was great and I forgot about all the everyday things like washing the floor mats and cleaning the toilets and could really concentrate on work. Then she decided to move out west, so I added those tasks back on to my "to do" list. About a month ago I answered an ad in our clay guild newsletter for someone who needed studio space as a sculptor and would be willing to exchange work for it. We met. Everything seemed to work for both of us as far as the arrangement. My wheel has never been cleaner. This past weekend I didn't get into the studio until late and she had already gone. She asked me to make up a list of things to do, and I just ran out of time. When I went into the back bathroom, neat stacks of boards, dusted lights, orderly cleaning products were lined up against the wall instead of being strewn all over. My back porch had all the recycled boxes broken down. The little room that I keep the bubble wrap and the huge bags of peanuts in was also neatened up so beautifully that it made me want to weep. My thoughts ranged from amazement at the glory of it to the fear that she might find me so untidy that she wouldn't be able to continue our arrangement. Sometimes it's hard to ask for help. Sometimes it's harder to receive it. And then sometimes you get exactly what you needed when you couldn't even begin to think how to verbalize to yourself or another what they could do for you that could help. Clay dig, or clay dog? What boredom makes a dog do. The guilty look. No, I didn't do this. You're imagining it. Guess I'll have to start bringing chew sticks to work with us. I'm sure chewing clay is not part of a recommended diet. All of a sudden it's his new thing, though. Saw these great textiles at the Nelson Atkins Museum in Kansas City. I was there 8 years ago, but they built a whole new addition that was pretty great. Really enjoyed it. Will post some more shots later. Just experienced my first tremor on this side of the country. Been through a couple when visiting LA and one when in Indianapolis a long time ago. Didn't think this part of the country had THOSE kinds of problems! Now I need to run to the studio to make sure nothing shifted in the kiln. What a new curve to throw into the mix. Hope everyone is ok out there. I've gotten quite a lot of orders from wholesale galleries in the last month, so I am up to my elbows in clay, trying to sort all the pots needed, see what else I need to make and generally move them all from a state of dirt to a state of art exchangeable for dineros. During all this craziness, my husband (always the businessman) asked a pointed question on if this all was profitable. What a question! Anyway, I decided I would tally all the hours and see how this all pans out with expenses, time, etc. I read an article in the last Ceramics Monthly or Pottery Illustrated on a clay person who had recently done this and thought I should do my own study for my own satisfaction. If anyone can remind me of which issue this was in, that would be great. I'd like to review it and it is probably in a stack somewhere. "I can use my allowance to buy one of these, you can buy the other and maybe mom will buy this one for me." commented Vicki (a different one, but around age 11, ) on a visit to the gallery with her grandmother so she could pick out pottery for her birthday. This little girl wanted POTTERY for her birthday! Note: her grandmother bought one piece and she did use her own money to buy another, but mom had already gotten her a birthday present.
" I could come after school and help you out. I could clean up or help you make things. I can give you my cell phone and you can call me." Dean, just turned 13. And he did give me his cell phone number. Besides being very sweet, these conversations were inspiring to me. They reminded me of the joy that clay can bring to others and how much kids are able and desire to help when they are excited about a subject. I just read a great post by Whitney Smith about the idea of perfection in your work and how it can twist your soul and body into unbelievable torture trying to accomplish the idea of that. Wonderful post and it really hit home because I have just shipped out several orders and this idea always plagues me after I send work out. Mixed Sets are really popular right now, at least according to my custom orders. This was a set of canisters I recently completed. I also am 1 plate short of completing a dinnerware order that has 3 handbuild scalloped edged plates, 6 handbuilt triangular salad plates and 3 thrown, squared plates with carving on the rims and then 6 bowls to match. The green and honey-gold glaze tie them together, but each plate is different and like a small painting. And then there's the order for 2 different plates, to coordinate with other plates from other potters. I like it. It's an individual world with people being able to have something unique and lovely but not the same as anyone else. Gosh, these people have won the pottery lottery, because the odds that almost anyone else out there has something similar are about one in whatever the population of Earth currently is. Pretty cool. I am feeling extra super duper cool about being a potter right now. Plus, I had a darn good kiln firing yesterday. These are some finished salt and pepper shakers that I have been experimenting with. The project itself was inspired by an article in Pottery Making Illustrated from May/June 2010 by Keith Phillips. They are the kind that don't have holes in the top, just a small funnel in the bottom. They were a lot of fun and I have been using the new Chartreuse glaze I've been developing in various combinations with my other glazes. Lots of fun. Great Fireworks Show last night, courtesy of G-town. Hanging with this crowd of mud-slingers this coming weekend! Had the first tomato sandwich of the year. Sorry, no pictures. I ate it too fast. I admit I was pushing it a bit as our tomatoes were only just turning ripe. But it was good and really brings home the fact that summer is here. Loaded a kiln while the weather seemed calm. It's a challenge with those pop-up thunderstorms! Here's a nice luncheon salad for you. Of course, it should be served in a handmade bowl! chop up the tomato and basil as fine or as coarse as you like and throw in, dash over and drizzle on the rest of the ingredients. Enjoy!